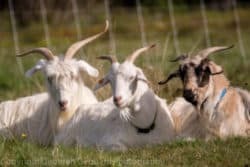 East Meets West Family Farm is homestead sized farm raising Cashmere goats, Wensleydale sheep and Wensleydale x Romney lambs. The farm is also home to a few Angora Rabbits. For our Cashmere goat breeding practices we follow the standards for the North American Cashmere Goat. We practice intensive rotational grazing in the spring and summer months. We produce Cashmere goat milk soap, roving, hand spun yarns and finished products. We seasonal have white Cashmere yarn and roving for sale.